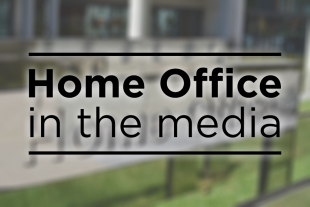 Today's Home Office stories include the Home Secretary's announcement on European Temporary Leave to Remain, police misconduct hearings, and the UK's position in global anti-corruption hearings. There is widespread coverage of the Home Secretary announcing yesterday that EU citizens arriving in the UK after March 29 must apply for visas to remain, in the event of a no-deal Brexit. The Telegraph reports that EU citizens coming to the UK after March would have to apply for temporary leave to remain if they wished to visit, live or study for longer than three months in the UK. The paper says this would entitle them to stay for a further three years before having to apply though the new Brexit immigration system from 2021. While the Telegraph reports the announcement as a “move designed to end free movement if there is no deal”, the Daily Mail reports that the announcement means that a no deal situation “will keep doors open to EU migrants for three years”. The paper says that “unlimited numbers of EU migrants will still be able to come to Britain” until 2021. The Telegraph reports that a police officer who was suspended for more than three years has revealed she tried to take her own life due to the stress of waiting for her misconduct hearing. The paper says that Rachel Short was removed from her duties at Devon and Cornwall Police in 2014 when she embarked on an “intimate” relationship with a man being investigated for drug offences. The paper says she then had to wait three years and 136 days for misconduct proceedings to be conducted, where a panel found she had breached the force’s standards of professional behaviour. The paper says that Ms Short resigned before the hearing and said the trauma of being kept waiting to answer the allegations against her led to an attempt to take her own life. The Police Federation are quoted in the article saying there was “no other field of work” where the threat of losing their job could hang over employees for so long. Devon and Cornwall Police are quoted saying that misconduct cases must be thoroughly investigated and welfare support was provided, but the delay was caused by issues outside of its control. The Government takes policing integrity very seriously and has introduced a programme of measures to reform the handling of complaints and disciplinary procedures involving police officers and improve standards of behaviour. The latest phase of reforms, due for implementation this year, will improve how misconduct hearings are prepared and conducted to ensure a more effective, timely and fairer hearing process. They will also overhaul the complaints system to make it more customer-focused, simple to understand and ensure cases are dealt with quickly – not only to benefit the general public but also for the sake of police officers who have done nothing wrong. The FT reports that the UK has recorded its first slip, in a global barometer of corruption, in what campaigners called an “important warning” for its post-Brexit future. The paper reports that the UK has dropped three places to 11th in the world in this year’s Corruption Perceptions Index, published by Transparency International. The paper says this drop arrives at a time when the Government has ‘pledged a tough response’ to financial crime. We have done more in the last 18 months on combatting dirty money and corruption than any government for decades. We are determined to keep up the momentum.